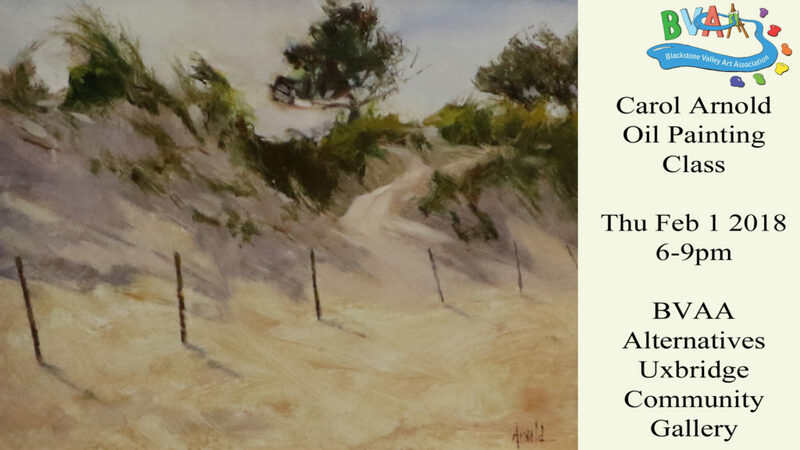 Carol Arnold, a member of Richard Schmid and Nancy Guzik’s Putney Painters, is now offering oil painting classes at the Uxbridge Alternatives Gallery! All levels welcomed. The focus will be on drawing, edges, values and color. Carol’s goal is to make this fun and inspiring, while learning how to get to the next level of your growth! This is an ongoing class that will meet on the first Thursday of every month from 6-9 pm. The cost per student is $15/hour if there are 5 or more students in the class. If there are less than 5 students in the class, the cost per student is $20/hour. Class will be cancelled if fewer than 3 students register. The maximum class size will be 10 artists. The cost per student is $15/hour if there are 5 or more students in the class. If there are less than 5 students in the class, the cost per student is $20/hour. This class is open to the public. Please make sure you register beforehand so we know how many to expect. The featured instructor for this class is Carol Arnold.